User Profile: Uriel Castillo isn't just working with CAD — he's making Fort Wayne a better place to live. Uriel Castillo is a CADD technician III, working leader, in the City Utilities Engineering department in Fort Wayne, Indiana. His position encompasses a wide range of duties, but he always has the same goal in mind: transforming his city into a better home for its citizens. 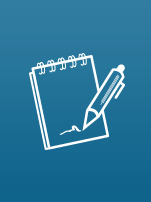 Cadalyst: Tell us about your current job. Castillo: Usually, especially during our busy summer construction season, the majority of my day consists of CAD work with our core software, Autodesk Civil 3D, or a supporting application, such as Autodesk Design Review or a Microsoft Office product. I often modify or create standard departmental water and sewer details to carry the design supplied by our engineers and designers into full-blown CAD plan drawings of a water or sewer project. Our department also handles the engineering needed for maintaining our city’s water and sewer infrastructure, so I occasionally work on a project for the water filtration or waste control plant, or something such as a pump station. Uriel Castillo, a CADD technician for the City of Fort Wayne, Indiana, is happy working behind the scenes to improve the city he calls home. The last update to my job description gives me the ability to assist with project design, and also adds many CAD manager–like duties such as budgets; researching, obtaining, and maintaining CAD hardware, software, and supplies; distributing workloads; and establishing standards — tasks that historically have been handled by a CAD manager. These are all tasks that are done in the background, in tandem with everyday CAD production, yet are essential to keeping a CAD department running smoothly and efficiently. How does working for a utility affect your designs and workflows? Our workflows really aren't that different from those used as best practices by companies and private-sector entities. When they do differ, it's usually because there are outside entities or departments involved (such as a right-of-way or parks department), or projects may have to go through a certain municipal board for approval and review. We also have to coordinate with many other utility companies who have their own infrastructure within our city’s roads and easements. And because we’re ultimately working for the citizens of Fort Wayne, we always have to take into account how a design would affect anyone in and around our city and project area. The most rewarding thing is knowing that while not many people may remember my name after my career is over, I am doing my part to make our city a better place to live for our children and everyone else who calls it home. I like to think of myself as a public servant, and I try to do everything for the best interest of the people of our city. I also really enjoy working with a team of talented engineers, designers, and other staff members on more than just CAD. I feel really blessed that I am given the opportunity to work with them on projects and standards, and provide input that will leave our department and our city in better shape for future generations. Our standards and standard operating procedures — which we are currently in the process of updating and expanding. You would be surprised at the amount of time saved when everyone understands and follows procedures and standards that are clearly spelled out. Believe it or not, good ones create greater productivity, efficiency, and better work morale. Describe some projects you especially enjoyed working on. 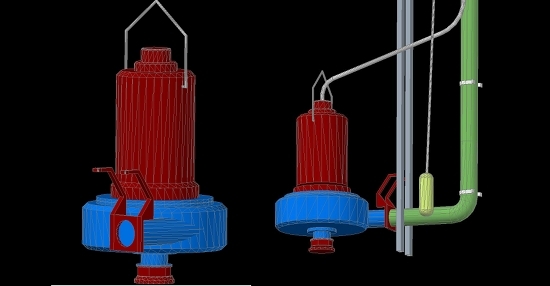 The 3D models for this pump — shown at right with a float, pipes, and brackets — were created from scratch for a combined sewer outflow dewatering project. Other challenging projects involve separating combined sewers into storm and sanitary pipe networks. With Autodesk’s Civil 3D application and a good field survey, we can generate an accurate surface of the project’s terrain, and an accurate representation of the pertinent existing underground utilities. This helps us with the layout and elevations of our proposed design. Pipe network models can illustrate how underground utilities are positioned relative to each other (left) and relative to the street surface (right). The 3D model is extremely handy in areas that are really busy, with lots of existing utilities installed and modified over the years. We had one project last year where, because we modeled all the existing and proposed sewer structures, the contractor said he had never before installed a custom structure that fit and went in so well. Sometimes we get to use our software capabilities to do fun things with data, such as creating residual chlorine maps from data collected and exported to Excel spreadsheets. Because Civil 3D also has Map 3D, we have the capability to create map books and delve into GIS-type drawings and/or maps. I also really appreciate the ability to model existing conditions of our utilities and project sites in 3D. It enables us to assist our engineers and designers with different proposed design scenarios, and to catch otherwise unforeseen problems and conflicts early in the design process — hopefully saving our city, department, and citizens substantial amounts of money. What drew you to CAD? When I was in high school, I took a drafting class as an elective. The class consisted mainly of manual drafting; CAD and personal computers were just beginning to be seen in high school classes. (This is going to make me sound really old, but believe me, it wasn’t that long ago.) Our class had just one computer, which ran AutoCAD release 12 or 13. At first, I wasn’t interested in it. It seemed to be all Command line–driven; you had to know another language to do anything with it. I thought I would never be able to work that program. One day, however, our teacher showed us a sample vector line drawing of a Space Shuttle. He demonstrated how you could zoom through the colorful drawing, and then he printed it on a fascinating x,y pen plotter. I was hooked — I needed to know more about this cool computer-aided program. I believe that the next stage for CAD is going beyond 3D to what many of us now know as BIM (building information modeling). We don’t currently use BIM internally in our department, but I expect we will once it becomes more prevalent, accepted, and standardized. Our City owns and maintains many buildings, and I believe that BIM could help us with their design and maintenance lifecycle. With all the combinations of commands and tools available, there are many ways to get the same end result in CAD; don’t re-create the wheel. Use whatever process already exists, and set up industry-proven best practices in your workplace. Today’s CAD programs allow not only for the ability to reuse objects and data, but also things such as setups and settings. Also, the Internet offers a plethora of CAD resources that can make managing CAD a whole lot easier and more fun: forums, blogs, blocks, LISP examples, best-practice papers, training, videos, etc. When you’re trying to do something in CAD, chances are that someone, somewhere, has already done it. Why not learn about the obstacles they encountered so that you can avoid them? Over the years, I’ve been interested in a variety of different activities, from working on vehicles to sports to gardening. While I still enjoy many of those things, I’ve grown to have more interest in the things that I feel really matter to me: my family, my friends, and my religion. I really enjoy spending time with my wife and three kids, as well as my church family. As a Christian, I believe that God has placed everyone on earth for a reason, and I’m trying to fulfill that as best as I can.